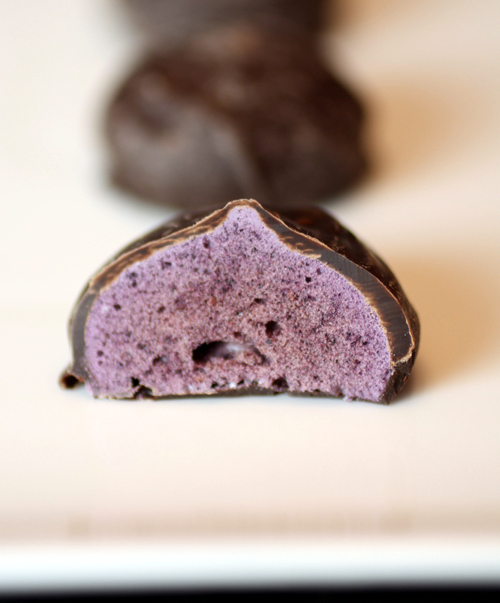 Then, meet CocoaBerries — the newest treat from Rubicon Bakery. If you don’t know Rubicon Bakery, you should. For more than a dozen years, it has created baked treats that are sold at many Bay Area stores, including Andronico’s, Costco, Zanotto’s, and Whole Foods, as well as Rubicon’s online site. It is part of Rubicon Programs, Inc., a non-profit that provides training, employment, and housing to those in need. The bakery offers work-skill training and entry-level jobs for those who are homeless, or suffer from mental disabilities or addictions. All revenue from the bakery, minus costs, are donated to the agency. The CocoaBerries are available in two flavors: Strawberry and Blueberry. Each 2.7-ounce box is about $5.50. I’ll use my patented scale of 1 to 10 lip-smackers, with 1 being the “Bleh, save your money” far end of the spectrum; 5 being the “I’m not sure I’d buy it, but if it was just there, I might nibble some” middle-of-the-road response; and 10 being the “My gawd, I could die now and never be happier, because this is the best thing I’ve ever put in my mouth” supreme ranking. 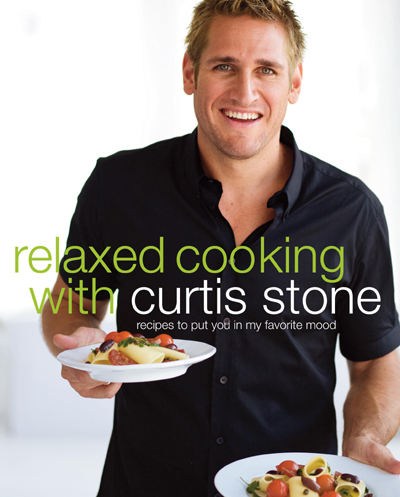 Meet Aussie chef, Curtis Stone, 2 p.m. April 11 at Sur La Table in San Jose’s Santana Row. The chef, who has cooked at top London restaurants, also stars in the Learning Channel’s show, “Take Home Chef.” He will kick off the day with a cooking demo in Santana Row Park. Then, he’ll head over to Sur La Table to sign copies of his new book, “Relaxed Cooking with Curtis Stone” (Clarkson Potter). The cooking demo is free; cookbooks to be signed can be prepurchased at Sur La Table starting April 7. Call the store at (408) 244-4749 for more information. Santana Row has another enticing offer for you: Enjoy a two-course, $24.95 prix fixe dinner on any Sunday through April 16 at one of 12 participating restaurants, and receive two tickets to the world premiere production of “The Kite Runner” at San Jose Repertory Theatre. Just take your receipt to the Santana Row Concierge office to receive a voucher for the tickets while they last. We came for the pizza. We stayed for the soft-serve. 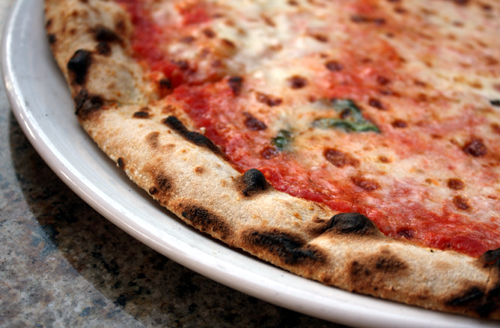 After all, when no less an authority on Italian cuisine than Mario Batali declares in a national food magazine that the Margherita pie at Pizzeria Picco in Larkspur is the best in the country, well, one must high-tail it over there to try it pronto. My hubby and I finally did (hey, it is a hike from the South Bay). A cyclist, my hubby got a kick out of how so many of the pies are named after bikes, including the “Specialized” (Hobbs’ pepperoni, house-made sausage, tomato, mozzerella, and basil), and the “Seven” (oyster mushrooms, mozzarella, parmesan, pecorino, and oregano). Since his nickname is Meat Boy, he opted for the “Cannondale” (house-made sausage, roasted peppers, spring onion, mozzarella, and basil; $13.50). I, of course, went for the Margherita (tomato, basil, house-made mozzarella, parmesan, and De Padova extra virgin olive oil; $10.95). Since the pizzeria itself is teeny-tiny and it was a beautiful, warm evening in Marin County, we sat outside at a wrought-iron table. The Pizzeria is adjacent to the larger Picco Restaurant, which has a more expansive menu. Both were started by long-time Bay Area Chef Bruce Hill. Wendy Lieu sports a degree in managerial economics from the University of California at Davis. Younger sister, Susan Lieu, holds a degree in social studies from Harvard University. Besides brains and aptitude, of course, the two siblings share something more — a passion for entrepreneurship and for all things chocolate. 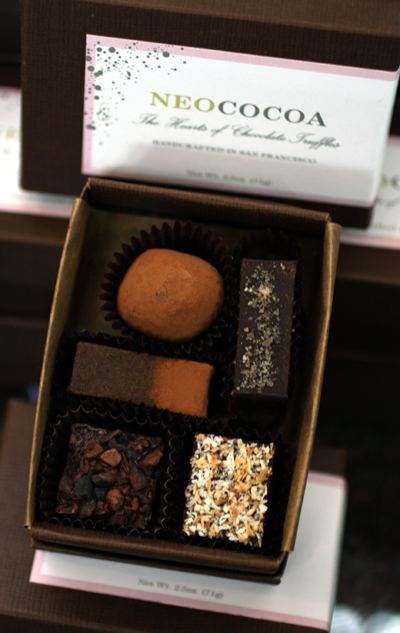 In 2001, they combined those interests to create Socola Chocolatier in Oakland, a gem of a truffle business, where the confections are hand-made with Scharffen Berger chocolate and Straus Creamery dairy products. Wendy, who also graduated from the pastry program at Tante Marie’s Cooking School, is the chief chocolatier. 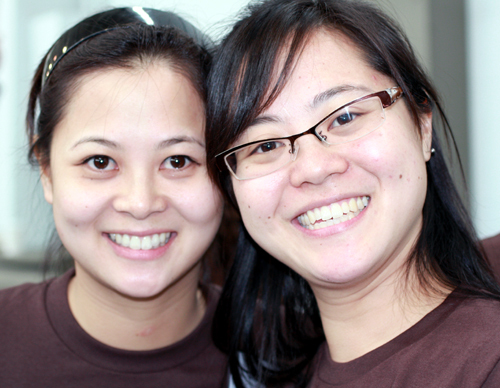 Susan is chief cheerleader and marketing whiz for their company, the name of which means “chocolate” in Vietnamese. Sweets have a long history in their family. Their grandfather helped feed his large family by making pastries that were sold every day at the market in Vietnam. And it was her grandmother’s recipes for chocolate confections that Wendy first experimented with before starting Socola. 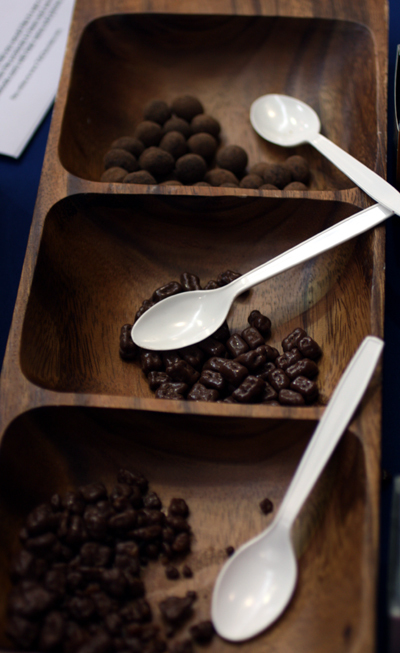 The two sisters proudly displayed their chocolate wares and handed out samples at this past weekend’s San Francisco International Chocolate Salon. If you missed that, no worries. The chocolates can be ordered online or found at such stores as the Alameda Natural Grocery in Alameda, and Daily Delectables in Oakland. Later this month, Whole Foods in San Francisco’s South of Market neighborhood also will begin stocking them. A box of one dozen chocolates is $25. That was the scene at last Saturday’s San Francisco International Chocolate Salon at Herbst Pavillion, where 30,000-square-feet of space was devoted to all things chocolate. Yours truly was lucky enough to be a judge for the chocolate competition. I think chocolate is still coursing through my veins from all that nibbling. * Van Gogh Dutch Chocolate Vodka: Think the taste of chocolate milk, but in the form of clear vodka. This is one smooth operator, even when tasted straight. It goes down easy, with no serious burn. A truly elegant and polished spirit. A 750ml bottle is about $30. * William Dean Chocolates: Bold colors (green, fuchsia, azure, bright orange) and unique shapes make these truffles extremely eye-catching. 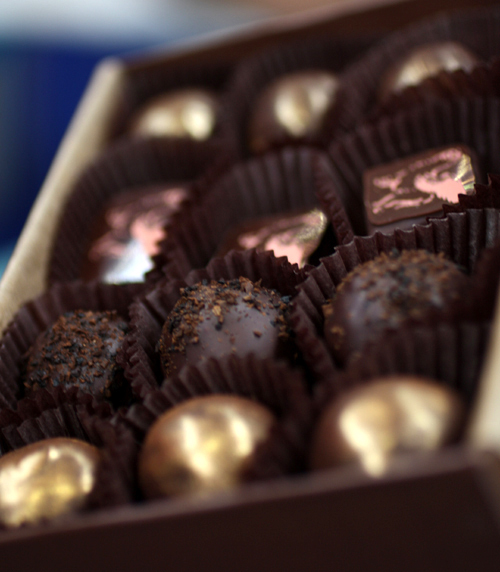 The Largo, Fla. chocolates are all made by hand. The PB&J is a masterpiece: milk chocolate and peanut butter with the crunch of peanut brittle, and a sweet, complex jelly made from three different fruits. A nine-piece box of assorted chocolates is $18. * Marti Chocolatt: Filipino-American Tonet Tibay studied the art of chocolate making at Ecole Lenotre in Paris. These exquisite creations explode on your tongue with the assertive flavors of pandan, ginger, rose-raspberry, and even goat cheese. 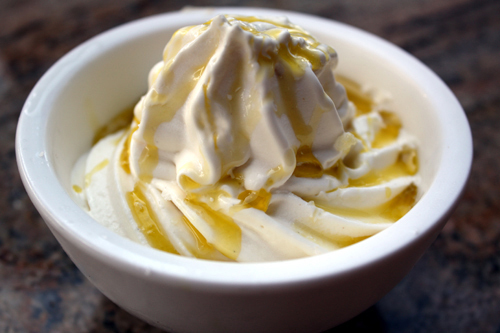 The durian is creamy, bold and complex. 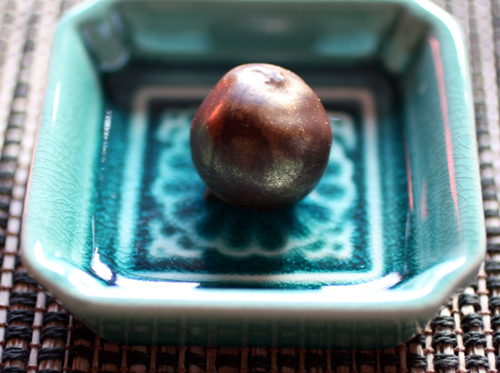 Made in Los Angeles, these are chocolates that grab your senses. 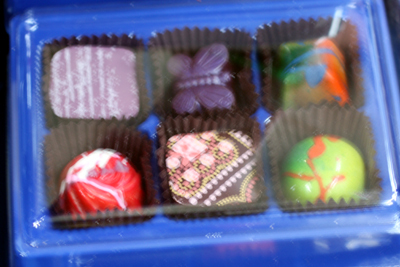 A box of six bonbons is $13.50.